This chapter describes how EDQ can be configured to read and write XML data files. You can use XML data files in snapshots to read and write the data contained in the file. A snapshot is a staged copy of data in a data store that is used in one or more processes. EDQ provides two types of data stores for working with XML data files: Simple XML and XML and Stylesheet. Both are available for server-side and client-side data stores. Simple XML data stores can read and write XML files that have a simple 2-level structure in which the top level tag represents the entity and the lower level tags represent the attributes of the entity. XML files exported from Microsoft Access are an example. The root element name is not used, so it can be anything. 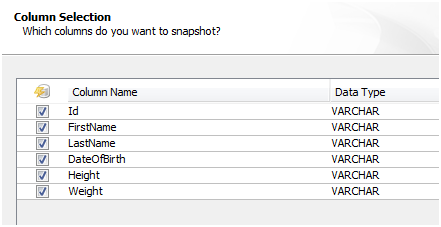 The record element name appears as the table name in the Table Selection page of the Snapshot Wizard dialog. 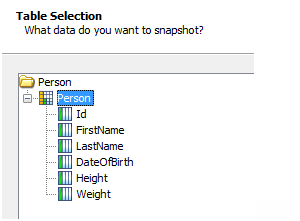 The lower level element names appear as the column names in the Column Selection page of the Snapshot Wizard and therefore become EDQ attribute names. When generating Simple XML files using an EDQ export to the data store, the name of the data store defines the record XML element name. The element Person in the example in Using Simple XML Data Stores shows how this appears in the XML. When there is a requirement to work with XML of a different structure than that of Simple XML, then you use the XML and Stylesheet data stores. For more information about XML stylesheets, see the W3C website found at http://www.w3.org/Style/XSL/ and http://www.w3.org/standards/xml. DN-XML is the format by which custom XML can be processed by EDQ. 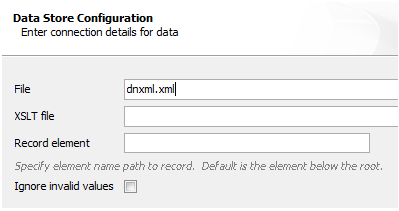 This is the equivalent DN-XML for the example given in Using Simple XML Data Stores. Note that the EDQ attribute names are defined differently in DN-XML compared with Simple XML. Because DN-XML uses attribute content to specify EDQ attribute names, it is possible to create EDQ attributes with spaces and other special characters in their names. Date values in DN-XML files should be specified in the XSD date format (ISO 8601). For example, '2008-10-31T15:07:38.6875000-05:00' or without the time component simply as '2008-10-31'. Within a data record, value elements are used to specify EDQ attribute values for the record. The name attribute is used to specify the EDQ attribute in question and the text content of the attribute specifies the value for that EDQ attribute. For example, the XML fragment, <dn:value name="FirstName">Fred</dn:value>, assigns the value 'Fred' to the EDQ attribute 'FirstName'. Similarly, EDQ can write DN-XML files by exporting data to an XML and Stylesheet data store with the XSLT option left blank. XML files in custom formats can be read by EDQ using the XML and Stylesheet data store configured to use a custom XML stylesheet (XSLT) to transform from the custom schema to the DN-XML schema during data snapshotting. The data can be read in to EDQ by creating an XML and Stylesheet data store and specifying the location of the XML source file and the XSLT file (stylesheet). EDQ reads the source XML file in chunks for efficiency breaking up the file on record boundaries. By default EDQ uses the element immediately below the root as the record element. If this is not the case in the source XML file then an XPath-style expression to the record element from the root must be specified. XML files in custom formats can be written by EDQ using the XML and Stylesheet data store configured to use a custom XSLT to transform from the DN-XML schema to the custom target schema the during data export. The data can be written by EDQ by creating an XML and Stylesheet data store and specifying the destination for the custom XML file and XSLT (stylesheet) file.